"Your kindness can change the world!" 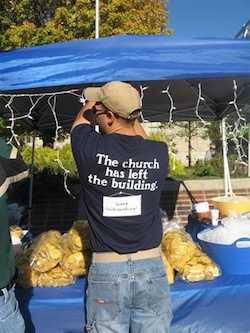 KindnessResources.com is the best place to find outreach resources that help you show God's love in practical ways to the people in your community. Kindness Outreach inspires and instructs Christ-followers how to use kind actions to invite others to explore God with the. KindnessResources.com is the brainchild of Steve Sjogren, best-selling author and founding pastor of the Cincinnati Vineyard Church. Steve Sjogren launched the Vineyard Community Church in Cincinnati, Ohio in 1985 with 37 people. Under his leadership, the dynamic congregation grew to more than 6000 in average attendance. From the onset VCC had a strong emphasis on servant evangelism, small groups, church planting and caring for the needy. Following a medical accident in 1997 and during his recovery, Steve became the Launching Pastor. Through the years the church planting internship program and Steve’s coaching efforts have produced several dozen successful church plants. Steve and his wife Janie live in the Los Angeles area. He stays focused on writing, speaking and mentoring church planters. Steve’s passion for evangelism, church planting and leadership development is reflected in his writing. Why Kindness? Principles and Pay Off from ExploreGodChicago on Vimeo. Started by Network Creator / Coordinator Nov 18, 2018. You need to be a member of Kindness Outreach ~ Resources for Making Disciples Who Invite Others to Explore God to add comments! Kindness Outreach is the perfect strategy and resource for building bridges into the lives of friends and neighbors in your community. The Prayer-Care-Share framework is a low-risk, always-welcomed, way to invite people to explore truths about God.